I’ve been leading growth efforts for companies for 25 years (YIKES! That’s a long time). Make no mistake, there are two things that I’ve absolutely loved for my entire adult life - sales and growth (oh yeah, and my wife, kids & dog too). I’ve been lucky because I’ve gotten to enjoy the sales and growth journey not only for myself and my company, but for a wide swath of companies in the process. While I’ve absolutely loved the intricacies, strategies and even challenges of growing a business, there was one area that absolutely frustrated me and cost me (and the companies I worked with) countless opportunities and money. I was simply unable to build predictability into the growth process. I was not alone in this frustration. I found that the lack of predictability was an endemic crisis for the vast majority of small and mid-market businesses (SMBs) embarking on the same journey. From the work I’ve done with SMBs and other peer groups I’ve participated in, I’ve learned that the vast majority of execs in these companies have less than six months clear visibility of growth (and many can’t even accurately predict three months ahead - I know I couldn’t). The operations side of the business is constantly disrupted because growth tends to come in chunks, with little opportunity to plan and prepare for it. This increases the costs of servicing customers and creates a poor customer experience. Capacity, on both the growth and operations sides of the business, is a delicate balancing act because the company cannot invest ahead of the growth being realized. Sales costs are higher than they should be as the company never gains the benefits of a sustained demand generation process. Only a portion of the potential business that should be captured is. Our research shows that the typical SMB is only able to capture 60-70% of the new business they should be able to capture. This is caused by the lack of efficiency and acceleration that a scalable growth model allows. Brian Halligan, CEO of HubSpot, shared a great breakdown of this problem in a post he wrote sharing HubSpot’s journey from “startup” to “scale-up.”Halligan points out that one of the big differences between the two phases is that in the startup phase, the math for growth isn’t clear and as a result there isn’t predictability. In the scale-up phase, the math is clear and growth becomes predictable. While I used to joke that our business was like a seven-year-old startup, the problem with that is that startups eat more energy and resources than they return. Startups are fun, but if you really want to create business value you’ve got to get to a scale up phase. After reading Brian’s post, I realized I wasn’t joking, and that many mid-market businesses are 10, 15 and even 20 year old startups. The last five years (and especially the last two and a half) have been a very different experience, as we’ve been able to build real predictability into our demand generation and growth efforts. 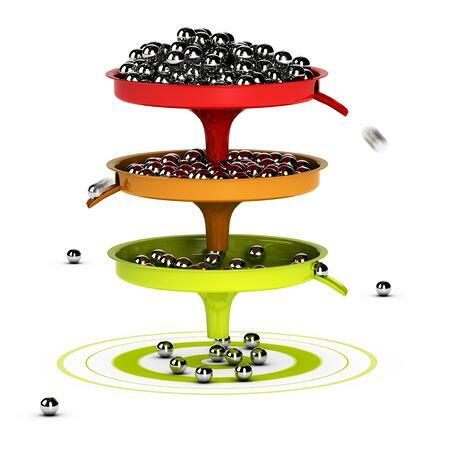 Adopt a full-funnel, demand generation strategy. Determine your conversion rates from one stage of the funnel to the next. Document the targets in your marketing-sales service level agreement (SLA). Execute the plan to achieve your targets. Leads: These are individuals that enter your funnel/database through a variety of means. This could be the result of inbound activities, networking, trade shows, etc. The point is that they represent individuals (not companies) and no qualification has taken place yet. We like tracking this metric as it allows us to see what channels produce a higher yield of qualified leads than others. Qualified Leads (QL): An important rule in B2B prospecting is that you should qualify the company, not the contact. Therefore a qualified lead, in our parlance, represents a lead that passes through what we call a “quick fit test” to determine if the company the lead represents fits our desired client profile. If the answer is “yes,” they move to the QL stage, otherwise they’re eliminated. Marketing Qualified Lead (MQL): This is where things begin to really matter, and in our experience, companies begin making mistakes in the funnel management. This represents a very high-leverage opportunity for growth. It’s so important that we’ve found to manage it properly, we had to create two stages for MQLs. At the first stage, an MQL represents a company (no longer an individual) that we have directly confirmed fits our client profile and where one of our defined personas has shown engagement with us. This engagement must be more than merely downloading white papers, ebooks, etc. We’re looking for engagement and conversation with one of our sales development reps (SDRs) or with very select online assets (say they’ve watched all 34 minutes of one of our key videos on our site). Additionally, we have confirmed who the primary persona (decision maker) is and we’ve begun to engage with them as well. Targeted Marketing Qualified Lead (TMQL): A TMQL represents all of the attributes of an MQL (fit and engagement) and adds that the engagement is with the authority (primary persona) for the sale we are looking to make. While we set a target for MQLS as a group, we do pay attention to the balance of our MQLs and TQLs. If we see too high of a percentage of MQLs (and therefore a low TMQL balance), we know that the number and predictability of sales qualified leads (SQLs) will diminish until we improve the balance. We are engaged with the primary persona (Authority). There is a mutually identified business issue that needs to be investigated (Need). The prospect has an understanding of our value proposition and what the purpose of a sales call will be (Understanding). The company matches the criteria of our desired client profile (Fit). Opportunities: An opportunity exists when the prospect enters the company’s sales pipeline. You’ll notice that timing is not a criteria of an SQL. An opportunity meets the timing requirements to justify implementing the company's defined sales process. Customer/Client: These are the people that pay us. When we created clear definitions for our funnel, we were surprised to see immediate improvement in the predictability of our growth without doing anything else. Granted, the predictability isn’t always what you want (for example, you may realize that your growth prospects aren’t as strong as you wished they were). Even in those situations, the clarity the definitions created allowed us to create realistic expectations and everyone involved on the growth side knew what to do with each lead. I’ve learned that one of the actions that kills growth, and is caused by a lack of predictability, is overselling or hyperselling. When you don’t have clarity, you treat every lead as a scarce resource and feel the need to close everything today. I remember when I first got the clarity of our funnel, I quickly realized that we were not in a position to achieve the revenue growth targets we had set for the next six months. While this was certainly frustrating, it allowed me to make the adjustments I needed to make. I controlled my spending a bit more, and focused on strengthening our overall funnel. So instead of burning out all of my people yelling at them to do something that wasn’t going to happen, we set clear goals and actions to fix the real problem. Today, we’re in a stronger position than ever. We’re able to hire ahead of our needs, and make intelligent investments because we’ve built this predictability into our process. Let’s build a sample funnel plan so you can see how simple - and powerful - this process is. When building your plan, begin with the end in mind by starting at the bottom of the funnel. Let’s say you’ve got five salespeople and they’re targeted with closing an average of six sales a quarter (depending on the velocity of your sales process, we recommend developing the plan on a monthly or quarterly time frame). So your goal is 30 sales/quarter. You know from your data and metrics (you are tracking those, right?) that you need to put 3.5 prospects through your sales process to win a customer. Therefore, to make 30 sales in a quarter, you need to create 105 opportunities. To get an opportunity, you typically need to talk with two sales qualified leads (in this case, ½ of your SQLs aren’t ready to engage in a defined sales process). In this situation, you need to be working 210 SQLs to generate 105 opportunities. How strong does your funnel have to be to support 210 SQLs? To figure that out, simply determine what percentage of MQLs turn into SQLs within your given time frame. In this sample case, we see that 25% of MQLs become SQLs in a quarter. 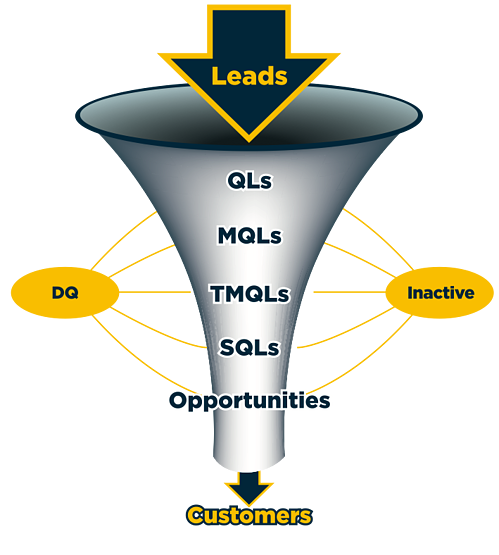 This means that for your funnel to support your objectives, you need 840 MQLs. Remember when I said earlier in this post, that this is a place where a lot of companies make mistakes? Here’s the mistake they make. They misinterpret this calculation to mean that they need to create 840 MQLs every quarter, when in fact they do not. This calculation simply means you must maintain 840 MQLs to produce 210 SQLs every quarter. So, how many SQLs do you need to create? How many SQLs are produced (and therefore need to be replenished)? How many MQLs get disqualified? How many MQLs go “inactive”? A missing component from the vast majority of SLAs that I’ve viewed is a protocol for moving a lead to an inactive status. For example, let’s say you’ve got a prospect company that is really engaged. They’re reading your blogs, downloading content and even talking to your SDR. Suddenly they go dark. They don’t visit your site for months, don’t return calls, etc. While they still meet your MQL definition, they’re not really active. In this case we put them in an inactive status. Our goal with them is now simply to get them engaged again. Going back to our example, we know that we’re going to pass 210 MQLs to SQLs, and our data shows that about 5% of MQLs turn out not to actually be qualified (42 MQLs) and 10% go inactive (84 MQLs). Now you know you need to create 336 MQLs every quarter (112/month) to meet your goals. Now your job is to implement the top of funnel activities that will generate 336 MQLs. Let’s say it turns out that you only have 400 MQLs, 85 SQLs and 55 opportunities. What does that mean? First, it means that you’re not going to close 30 sales this quarter - accept that fact. Second, it means you have a choice to make. Do you hold a motivational meeting, introduce spiffs and burn out your team in a mad dash to close as many sales as you can...and who knows in a Christmassy miracle you may even hit your targeted 30 sales. You will of course have a distressed, angry team, prospects that don’t really value you and a really weak funnel meaning that you get to work even harder to do a little less next quarter. Or, do you realize that the problem you must solve is that you haven’t tended to your fields to yield the volume of crops you desire and adjust your plans to solve the real problem? This will require that you adjust your plan, and your investments. It means investing more at the top of the funnel (taking it away from the bottom if you must) and implementing the tactics that lead to sustainable growth. I know the decision I made years ago. It’s the same decision that every company that scales growth and wins sustainably makes. Choose to build the structure for growth and enjoy the rewards (and time off) that come with it.